This model adds an Anti-lock Brake System to the new deluxe version Majesty SV. This is a 125cc scooter developed out of the quest for a bike with "just the right size" for around town use. 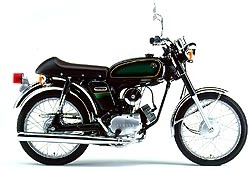 The power unit is an air-cooled 4-stroke SOHC single rated at 10 hp. The combination of elements like the V-belt automatic transmission and lightweight body with a dry weight of just 97 kg give this model a light and smooth riding feel. 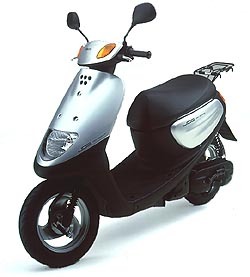 The Cygnus 125 Si is manufactured at Yamahas overseas production base Yamaha Motor Taiwan Co., Ltd. This model brings together the exciting acceleration and power of a 2-stroke with the outstanding handling characteristics demanded in an entry level model in the form of a full-sized 50cc bike. It also comes fully equipped with features like an electric starter, 6-speed transmission and tachometer. Reviving the black and white design of the 1970s Yamaha works machines gives an exciting new look to this model's "naked" styling. 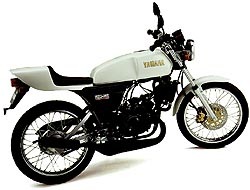 The popular "YB-1," a 50cc bike that offers the inherent joys of owning and riding a motorcycle, like the fun of operating a manual transmission and the pride in polishing up its chrome, is taken to new heights in this model with added trad appeal. The fuel tank is finished with a "sunburst painting image." This combines with chrome-plated accents on parts like the fenders and mirrors to add extra retro appeal to this popular bike. 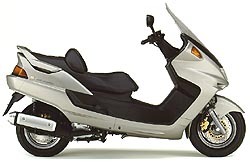 This next generation scooter achieves an optimum balance between factors like riding comfort, handling performance and storage space based on Yamaha's "G Concept." This "G Concept" derives from the first letter of the three features of (1) a Guard Lock that functions separate of the main key lock to also lock the rear wheel and the key hole shutter simultaneously, (2) the 23-liter Great Box that holds a helmet plus alpha and (3) the largest in class 7-liter Giant Fuel Tank. Adoption of other features like a long seat and wide-protection leg shield combine with the long wheel base to provide exceptional comfort and riding pleasure. 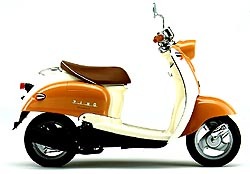 The popular Vino scooter combines "retro style" design with the kind of riding performance you want for practical everyday use. Features like easy to handle performance, cute retro styling and plenty of storage space are the secret to the Vino's popularity, and now it appears in new color variations to add even more individuality to the Vino world. Ten years have passed since the first BW's model made its debut. 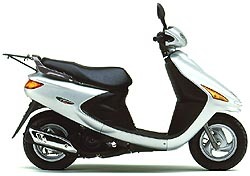 This new model is a 50cc scooter that keeps the original BW's fun-to-ride nature while adding features like (1) a helmet trunk space, (2) 12-inch tires (previously 10-inch) and (3) front disc brake to strengthen its great combination of riding performance and utility. Features like the wide 120 front and 130 rear tubeless fat tires ensure outstanding riding comfort and performance. 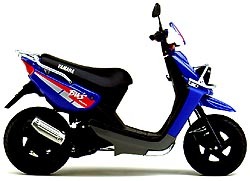 Another characterizing feature is the blue coloring reminiscent of the XTZ850TRX Dakar Rally machines.